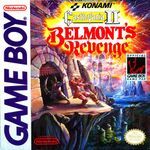 The second Castlevania game on the Game Boy is set 15 years after the events in Castlevania: The Adventure. Dracula kidnaps Christopher Belmont's son Soleiyu at his coming of age feast, and turns him into a demon. With Soleiyu's mystical powers, Dracula retakes human form and rebuilds his castle, forcing Christopher to confront Dracula once again to save his son and Transylvania. Unlike the previous Game Boy title, sub-weapons in the form of holy water and axes are available in the game. There are four initial levels, each taking place in a separate castle with unique theme such as air, plant, earth, and crystal, and can be completed in any order. There are also very large trap rooms in the levels. The game also utilizes a password system. Source: Wikipedia, "Castlevania II: Belmont's Revenge", available under the CC-BY-SA License.